MANCHESTER, N.H.--With Mitt Romney's strength in the polls in New Hampshire, the mayor of the state's biggest city hopes that a resolution to what he calls "the refugee resettlement question" will soon be at hand. While the Republican presidential candidates have been slugging it out in televised debates over issues like taxes and wars, one of the biggest local battles on the ground in New Hampshire has been over the place of 1,800 refugees from the tiny country of Bhutan. The debate is a parochial manifestation of what's sure to be a divisive issue in the 2012 presidential campaign: How will America treat its immigrants during a weak economic recovery? "I can tell you if he is elected it will be high on his radar screen," Ted Gatsas, the mayor of Manchester, told Yahoo News in an interview in his window-lined office last week. Gatsas endorsed Romney in December. (He says he received no promises from Romney and that he plans to constantly lobby him about the issue.) Romney's campaign didn't respond to a request for comment. Hundreds of Bhutanese refugees began arriving in Manchester, long a gateway city for immigrants and refugees, in 2008, when the Bush administration agreed to gradually take in 60,000 Bhutanese people who had been languishing for 20 years in refugee camps just over the border in Nepal. Bhutan expelled its ethnically Nepalese population in the 1990s, leaving tens of thousands of people stateless. Officials with the International Institute of New England, a non-profit government subcontractor that resettles refugees, say that Manchester is a great place for refugees because of its public transportation system and low unemployment rate. Most of the refugees are employed in Manchester and their participation in welfare is lower than that of local low-income people who are not refugees, according to the agency. From 2007 to 2010, the children of refugees had a 90 percent high school graduation rate, which is higher than the local population's. Gatsas says he doesn't believe those employment numbers, and he says he can see from his office window and from what his constituents tell him that refuges are suffering and living in poor housing. In 2009, one building where refugees lived was infested with bedbugs. He says at one local high school, 80 languages are spoken, which has contributed to the school district's low standardized test scores. He says local leaders should be able to decide whether their cities can absorb new refugees or not. "There's no question that this country is better than where they are [from]," Gatsas told Yahoo News. "But if we don't give the people that are here the opportunity to catch up, I don't know how we accept other ones." Gatsas, who is the grandson of immigrants from Greece and Lebanon, added, "I'm not saying forever. Give us one year or two years so we can at least get these people into the system." In July, the city's aldermen took the unusual step of passing a bill requesting a two-year moratorium on new refugee resettlement. (The State Department told the New York Times that it has granted only two cities their requests for restrictions on accepting new refugees.) After interviewing city leaders and refugees, the State Department reduced the number of new refugees that would be settled in Manchester during this fiscal year--which began in October--from 300 to 200. "That was an immense compromise for our families," says Carolyn Benedict-Drew, the director of the Boston-based International Institute. The 200 refugees will be relatives of families who are already there, she said, and some relatives of Manchester refugees may have to be settled in other cities. The federal government provides financial assistance to refugees for eight months, after which they are expected to become self-sufficient but may sign up for programs like food stamps and Supplemental Security Income. This has led to outcries from leaders in other states, most recently in Tennessee, who say refugees become a burden on communities. A bigger share of the 70,000 refugees the United States takes in each year are being placed in smaller cities like Manchester, instead of big metropolitan areas like Los Angeles or New York. The State Department began shifting refugees to smaller metropolitan areas over the past few decades, which has made them much more visible in their local communities, Audrey Singer of the Brookings Institute writes. Leaders in the local Bhutanese community are happy that the moratorium failed, but they remain wary of the mayor's insistence that the city can't handle more refugees. This month, representatives in the state legislature introduced a bill to give cities the ability to declare a one-year moratorium on new refugees, suggesting that the debate over their place in New Hampshire is far from over. "When the mayor came up with the moratorium…my parents were at the camp, were in the queue to come here," Suraj Budathoki, who moved to Manchester three years ago, told Yahoo News. "They had finished their paperwork and everything. When the mayor talked about moratorium here I thought, What's going to happen to them?" Budathoki's parents, who came to Manchester in September, live with him and his wife in a tidy ground-floor apartment that's adorned with poster-size photos of his nine-month-old daughter and filled with the spicy smells of Bhutanese cooking. Budathoki was sent to the refugee camp with his family when he was only 10 years old. He spent 18 years there before he came to America. "The moratorium that he is talking about has really created a lot of mental disturbances and tension to the communities who are already here," Narad Adhikari, who moved to Manchester five months ago and is still looking for work, told Yahoo News. Budathoki and Adhikari, both college graduates and fluent English speakers, work together to raise awareness about why they are refugees in the first place, explaining to politicians that Bhutan threw them out and won't take them back. Budathoki has met with the staff of both New Hampshire's United States senators to ask them to pressure Bhutan to accept the refugees in Nepal back into the country. There are encouraging signs in Manchester. 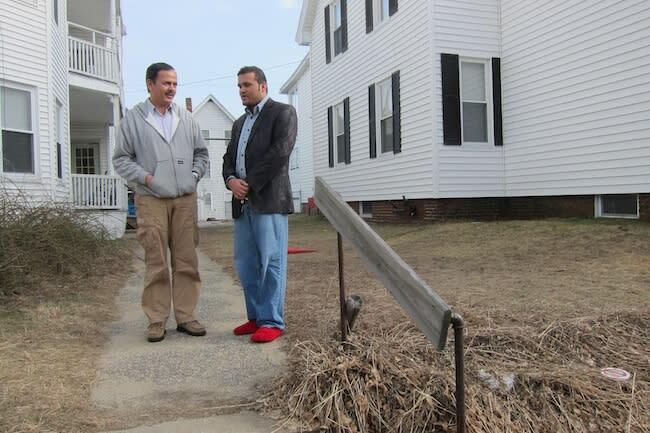 Tiki Acharya, the director of the nonprofit Bhutanese Community of New Hampshire, told Yahoo News that one Bhutanese refugee will become the first in the community to open his own business--a combination of an insurance shop and a South East Asian grocery store. Most of the refugees are not used to American-style bathrooms, stoves, food, or traffic rules, said Tiki Subedi, who works as a liaison between the school district and the Bhutanese community. He never saw a traffic light before he left Bhutan, he says. When the Bhutanese were in the refugee camps, they cooked with charcoal and lived in electricity-free huts. "Managing the expectations of refugees is probably a pretty universal problem," said Sue Corby, who runs the Center for Adult Learning in Manchester, which holds English classes. "Sitting in a refugee camp, the view of America is that there's gold falling off trees. There's pressure for them to send money back home. With all those pressures, they do get discouraged." Yet many Bhutanese families in Manchester do not speak English, according to Acharya. The English classes provided by the International Institute--and paid for by the federal government--lump together refugees who have never had a day's education with those who have spent years in a classroom, hampering the progress of both groups, he says. The students Subedi works with sometimes act out in class because they receive less homework and lighter discipline than they did at the United Nations-run schools in the refugee camp. "It's easier here, so sometimes they try to take advantage of it," Subedi said. • NH college students carry the most debt in the country. What would the 2012ers do about it?